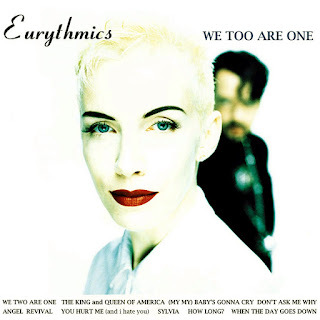 Switching to Arista Records in the U.S., Eurythmics made their last album together with We Too Are One, and they went out in style. Calling upon a broad pop range, their seventh album was their best since Be Yourself Tonight in 1985. The sound was varied, the melodies were strong, and the lyrics were unusually well-crafted. In retrospect, the album can be seen as a dry run for Annie Lennox's debut solo album, Diva (1992); songs like "Don't Ask Me Why" (which grazed the U.S. Top 40) serve as precursors to the dramatic ballads to come. There is, however, an air of romantic resignation throughout We Too Are One, appropriate to its valedictory nature. The disc spawned four chart singles in the U.K. and returned Eurythmics to number one in the album charts, but it did not substantially improve Eurythmics' reduced commercial standing in the U.S., confirming that it was time for Lennox and Dave Stewart to pursue other opportunities.